I have had two days at ProWine in Shanghai by now and I have seen a lot of booze come past. Mostly wine, but also beer and all sorts of vodkas from Norway, Belarus and Bulgaria. I sat down for a Chinese wine tasting, from Chardonnay to Cabernet, and have heard all about French rosé's. 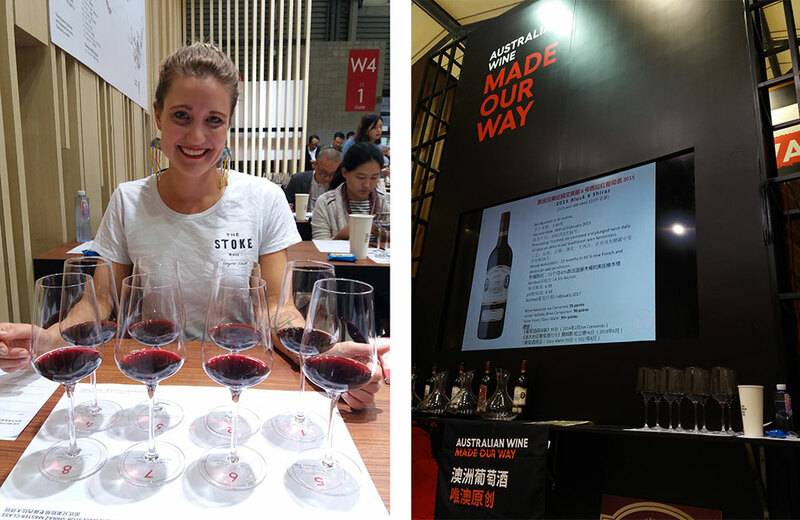 Today however, I take a seat to taste a little bit of home – and see what my Chinese peers think of McLaren Vale’s Kay Brothers. Duncan Kennedy, winemaker, and Michael Wehrs, sales, lead us into the depths of the many years of Kay Brothers Shiraz. In 1890 the Kay family started in the wine industry, as brothers Herbert and Frederick (Bert and Fred for the initiated) smelled a great business opportunity in grape growing. Victorian wine regions were struggling to keep their heads above water as the phylloxera bug was destroying their vineyards, and the Kay brothers (yes, where the brand name came from) decided to jump on board as the little pesky insect did not cross the border into South Australia. Lucky for us these two opportunistic siblings decided to make the best of this circumstance, as the Amery vineyard they started in McLaren Vale was, and is still, producing some absolutely sumptuous fruit. Not a lot has changed at the Amery vineyard since Bert & Fred started in 1890, with ‘Block 6’ and ‘Hillside’ harbouring the 123 year old Shiraz vines we are tasting the wines of today. For this session we are doing a vertical tasting including wines from 2000, 2005, 2010 and 2015 from both separate parcels of land. The first thing I notice about the eight glasses in front of me is that all of them have a beautiful colour. Even the 2000 wines, from both plots, have not moved much from the deep crimson that 2015 is showing. On the palate however, they show what a bit of age is doing to the wine; I am moving from descriptors like plum, dark chocolate and caramel through to minty liquorice with fresh dark fruit and a hint of strawberry. Clearly these wines, both from Block 6 and Hillside, are doing well with a bit of age on them. When asked what my pick would be out of the line-up I am finding it difficult to decide, as 2005 Hillside and 2010 Block 6 are tied for the first spot. Looking at my descriptors it clearly shows me that they are the wines with lighter and softer tannins, but this is where the comparison stops. The 2005 Hillside is smooth but dominated by nutty notes, whereas the 2010 Block 6 is all red fruit and earthy aromas! Duncan and Michael tell me they usually prefer the older vintages, and they are surprised to see that most of my Chinese peers in this class are going for the years 2010 and ’15. Both Michael and Duncan are great storytellers, aided by the fact that the Kay family have kept diaries about every little thing at their gorgeous slice of heaven in the Vale as well as the beautiful photos they chose for their presentation (you know, both the ocean and the Hills). I am making a mental note to look up the book when I get back home. That, or maybe I should just drive down South and go see the Amery property myself. I think I will find many more delicious wines from this special little spot of land in SA, like the 2017 Bushing King winning Grenache. That is of course, if I can pull myself away from the balanced and beautiful Shiraz this vineyard produces.